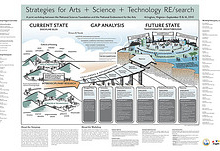 This joint workshop between the National Science Foundation (NSF) and the National Endowment for the Arts (NEA) to develop a national agenda for funding and collaboration integrating the arts and computing/information science. The event gathered 55 international thought leaders in the area. Attendees included leaders from the NSF and NEA, deans of arts programs, professors of computer science, nonprofit leaders, independent artists, and others advancing digital media and new forms of expression.